On a trip to the dog park yesterday, I was greeted by a picnic table covered with lemons. My friend's children picked them at her parents' organic grove, north east of San Diego and had enough to share. The sight of these golden oblong fruit, glowing like the sun sparked numerous recipe and drink ideas. 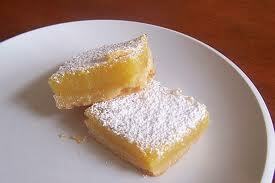 I grabbed five and headed home to bake a lemon square recipe I had grown up with. I hadn't made these tart and buttery treats for years. My Mom recently handed down the "Peanuts Cook Book" to me. Yes, I am referring to the Charlie Brown Peanuts. This book is a treasure trove of delicious children friendly recipes by June Dutton with illustrations from Charles M. Schulz himself. Just the sight of this cookbook as a kid made my stomach growl and brain burst with thoughts of Charlie Brown's Banana Cupcakes, Beethoven's Green Beans and Bacon and Shroeder's Chocolate Sauce. However, I loved nothing more than those self indulgent, satisfying sour treats. As I baked them the smell of butter and sugar swirled around our home and made our mouths water. This dessert did not disappoint my kids. Eating one is almost impossible. My son actually had one for breakfast - I didn't approve, but I clearly understood the power of these addicting squares! Blend with fingertips until well mixed and crumbly. Pat evenly into the bottom of an 8 x 8 inch baking pan. Bake for 20 minutes at 350 degrees. Pour over baked crust and return to oven for 20-25 minutes at same temperature. Cool on rack. Cut in squares. Sprinkle with sifted, powdered sugar.